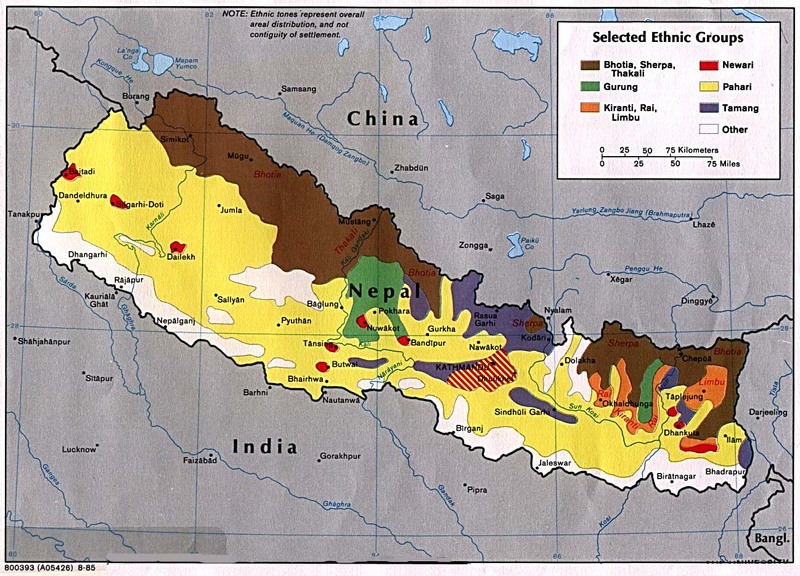 Nepal, a small nation at the foot of the Himalayas, between India and Tibet, is home to approximately 270 ethnic groups, each typically speaking more than one language or dialect. Their religious beliefs are equally distinct. 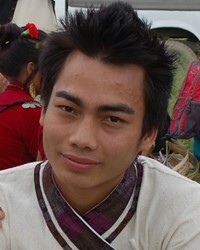 The Athpare Rai are part of a cluster of people known as the Rais, the largest group in eastern Nepal. The diverse groups in the cluster all speak various dialects from which most of these groups take their names. Although their facial features are clearly Mongoloid, the Athpare claim no relation to the Mongolian race. Instead, they believe they are descendants of the goddesses Marema, Mahadeva, and Nina, (daughter of the earth). Although the country is poor and undeveloped, the people of Nepal are dependent upon agriculture for their livelihood. The Athpare Rai are primarily rice farmers, but the men have a tradition of migrating to the cities for work. As farmers, the Athpare Rai have been limited by insufficient knowledge of technology, causing a poor yield in crops. They grow rice in the low-lying areas and potatoes, maize, wheat, and barley at higher altitudes. A beverage made from the barley and potatoes is used on all festive occasions. It is the men's job to plow the fields, while the women plant the seeds. Families often unite to help each other at harvest time. Farmers trade any surplus crops they may have for needed items such as kerosene and salt. Others supplement their often meager incomes through craftwork and tailoring. Collectively, the Rai are known as courageous, daring, and fearless people. In recent history they have won worldwide reputation for their bravery as "Gurkhas" in the Royal Nepalese Army. This means that they are considered to be among the finest soldiers in the world. Joining the army brings respect and a way out of economic hardship. Like other Rai groups, the Athpare Rai live in one or two-storied wooden or stone houses with thatched roofs. The houses usually have a wooden porch. Marriages are facilitated by kongpi, or middlemen, who are used by the families to work out the details of the marriage. Gifts are presented and if accepted, a marriage date will be set. Some marriages are still expedited by the arranged kidnapping of the girl of one's choice, as it is believed that this method brings about good results. The sacrifice of an animal, usually a pig or rooster, is often performed at this time. Marriages are very festive occasions and meat and drinks are served in abundance. Gifts are given to the parents of the bride and groom as well as to a long line of family members and village elders. Often the whole night is spent singing and celebrating. Although the royal family of Nepal (they do not have any power any more) is Hindu, as is the great majority of the population, Hinduism and Buddhism exist side by side and are somewhat intermingled. The majority of Athpare Rai are Hindus but there are a number of Buddhists and some animal worshippers as well. Over all, there is quite a wide variety of deities and worship practices among the people. These customs are most evident at celebrations of birth, marriage, and death. While they worship the various Hindu gods, they also follow a Buddhist way of life and obey the teachings of the Lamas. At the same time, they have faith in many local spirits and supernatural forces. The influence of Hinduism has led to many of the dead now being cremated instead of being buried. Nepal has long been hidden away and forgotten by much of the world. The government of Nepal is opposed to any form of proselytizing; and so government restrictions apply, but most of the time Christians can follow their religion. There are more problems from family members than from the government. * Ask the Lord to call people who are willing to go to Nepal and share Christ with the Athpare Rai. * Pray that the doors of Nepal will soon open to missionaries. * Ask God to strengthen, encourage, and protect the small number of Athpare Rai Christians. * Ask the Holy Spirit to soften the hearts of the Athpare Rai towards Christians so that they will be receptive to the Gospel. * Pray that God will open the hearts of Nepal's governmental leaders to the Gospel. * Ask the Lord to raise up many Christian fellowships among the Arthpare Rai.View Ath Pahariya in all countries.